Who Are the Poor I’m Supposed to Care For? As we leave our rented apartment in Rome and walk towards St. Peter’s Square I notice a ragged, filthy woman sitting on a piece of cardboard with a baby laying lethargically in her arms. She looks up with mournful eyes and pathetically mumbles something as she reaches out hoping I’ll put coins in her hand. A few feet beyond her is a man stooped over his cane so painful-appearing that he is barely able to lift his eyes to make contact with mine. 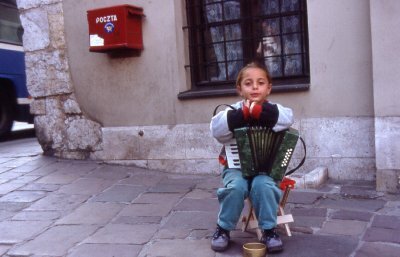 A paper cup is stationed on the sidewalk in front of him; he also reaches out a filthy hand plaintively begging for money. We stop by a sidewalk café for a quick coffee before entering the Square. 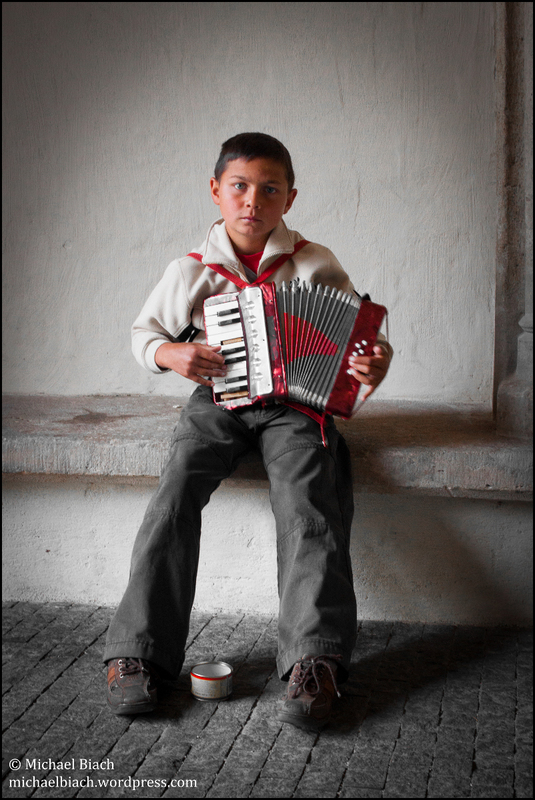 We are approached by children with tinny-sounding accordions. They boldly step up playing and singing. When they have finished a few moments of this “performance” they walk among the tables with their hands out. This weekend at Mass we were exhorted by Our Lord Jesus to feed the poor, clothe the naked, give drink to the thirsty and other sorts of charitable action to help the poor. But who are the poor Jesus is referring to? Are the people I passed on the street the poor I should help? Are they the one’s that Jesus refers to? Is the man sitting on the corner nursing the last few drops from his whiskey bottle the one I’m supposed to give a drink to? Many people asked these questions today and struggle with the commands to help the poor and the thirsty. They ask the question who are the poor and the thirsty and hungry? 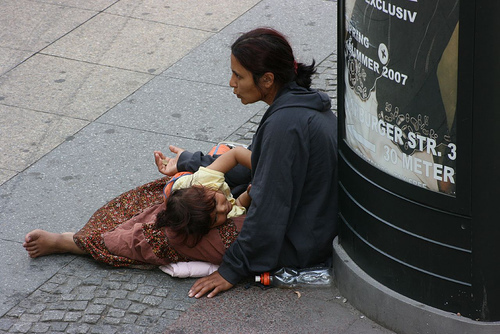 Most of the beggars we encounter in major cities around the world are what we call Romani, or more commonly known as gypsies. I don’t know all of them, of course, but we see everywhere children who do not go to school but are used as beggars and thieves to supply cash for the camp. My heart weeps for these kids as I see a young boy sitting in an underground walkway by himself all day without friends or family looking up to strangers who walk by ignoring him. It rips my guts out. I’ve often said to my wife, “I’d like to rescue that boy and take him home and raise them properly.” But if I did this, I’d be arrested for kidnapping. I picture my grandchildren and I have a sense of loathing, pity and despair. What can I do when they are part of a family and a clan that treats their children this way and think it is normal. If I give him money it only propagates his abuse. A kind word or bit of food is about all I can do with a clear conscience. Very wise words for a 10-year-old. It’s not that I believe that everyone is able to look out for themselves–there are many who are in desperate need of our help and unable to help themselves, but his point was well taken. I told him his father must be a wise man. I’ve watched a crippled man leaning on a cane whimpering in pain until 5:00 PM when his shift ended. He looked at his watch, he stood up straight and walked back home. He was there again the next day exploiting the sympathies of naïve, kindly-hearted people. Once my wife caught a boy with his hand in her pocket. Many of these people beg for a living and when they don’t make enough begging they steal. My wife lost her wallet this way not more than a month ago and tourists often find their passports, credit cards and cash have disappeared. This is why we repeatedly warn our pilgrims to watch out for pickpockets everywhere we go. Personally, I cannot give money to such folks because to do so propagates their lifestyle, supports their continued child abuse, thievery and despicable lifestyle. We cannot support and condone such conduct. How do I know the real poor and those that are just making a dishonest living, some of them quite a good living? Two things I try to do besides pray for folks that I see in need. First, if I see a person who is obviously in distress, missing a leg, blind, or some other obvious disadvantage I will pull money out and share with them along with a kind word. Second, I look for the Missionaries of Charity in their simple white habits striped with blue. It does not have to be their specific order but these I know and have confidence in. We know where they are housed in Rome. It is an inconspicuous door with a simple doorbells to the right. I push the doorbell, then push it again and sooner or later one of these beautiful sisters will open the door. 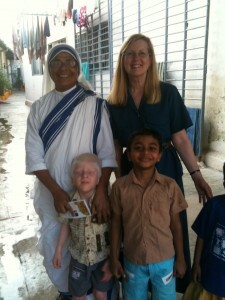 They all have the same gracious smiles and kindly faces as their founder, Mother Teresa. My wife and I return her smile and hand them a generous donation. 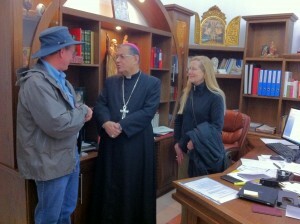 We ask them to use it for the poor and to assist in their ministry. I don’t know who really needs the money, but they do. 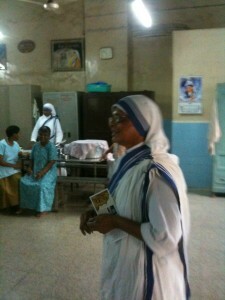 Once in Mumbai India we were invited to visit one of their compounds. They took us on a tour—room after room of disadvantaged, mentally handicapped, diseased and dying (out of respect we took no pictures except of the sisters you see here). One room contained about 100 cribs in neat rows each with a child unable to care for themselves. 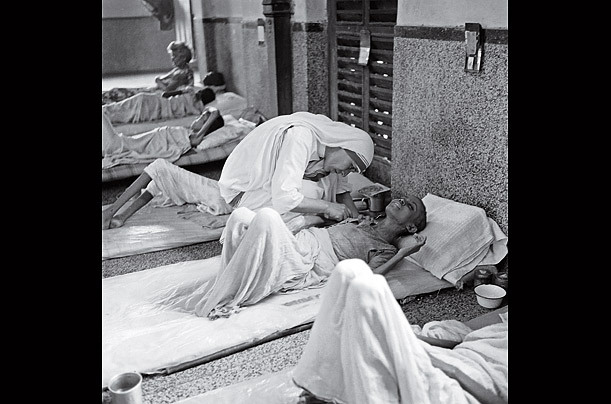 Many had diseases, mental handicaps, twisted bodies. Janet and I were in tears having never seen anything like this in our lives. What touched us most was the sisters and volunteers working among these castaways treating them with great love and affection. 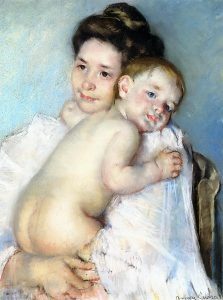 They bathed them, fed them, changed their diapers, caressed them. However, not everyone that comes to their compound are admitted. They are selective who gets admitted to their care. In Jesus’s time there was no Social Security, unemployment benefits, welfare and other social supports for the underprivileged. Churches had not begun charitable work and few cared for anything but themselves. In ancient Rome life was cheap and cities were full of slaves and the destitute. A drink or offering of food to a slave laboring under the hot sun was a true act of charity because no one paid any mind to the slaves. 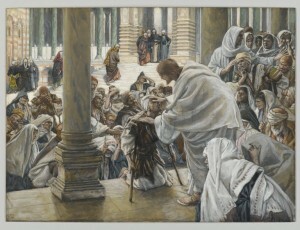 Jesus stopped to heal and care for the blind, the lame, the hungry of his time. In the time of Jesus, a woman without a husband or son could be left destitute. Unwanted infants were tossed under bridges only to be eaten by the wild dogs. It is no coincidence that Scripture often uses the care of widows and orphans as a sign of one’s spirituality. Many were unjustly imprisoned and the truly poor were cast aside. Were some poor because they were lazy or because they made poor choices? Of course. The book of Proverbs in the Bible is full of exhortations for hard work and to eschew laziness and sloth. It is the same today. But often others are made poor by choices of their parents or others around them. At the same time in America it is hard to think of someone as poor who has cable television, a cell phone and many other benefits and amenities of our modern welfare society–especially since I’ve seen so much from around the world. Our society has a good number who know how to milk the system, get what is undeserved and avoid the effort and work to care for themselves. There are still people who truly need our assistance and we should see them as Jesus himself. I am not one for condoning irresponsibility, laziness or habitual bad choices. But, we also want to help those who are truly in need as Jesus requires of us. Now that we are Catholics we make sure our donations are given to legitimate Catholic charities. We also make sure to help our own when they are in need. When we are in Jerusalem we take up donations and give money to the Patriarch of Jerusalem knowing that such gifts will be given to the truly needy among our brothers and sisters in the Holy Land. There are too many charities that use the money improperly and not all of it gets to those who need it. Unhappily there are many of these, even in the Holy Land. Discernment is important, charity is essential, obedience to Our Lord is crucial and caring for the unfortunate and disadvantaged is not an option. When we were Protestants we used to believe in “faith alone” but that mantra is hard to chant when hearing the gospel last Sunday which said heaven and hell will be the result of our choices—whether we care for others or whether we ignore them. Dear Lord, give us wisdom and charity and the means to help and willingness to do so. Mother Theresa, pray for us! “The most important person on earth is a mother. She cannot claim the honor of having built Notre Dame Cathedral. She need not. She has built something more magnificent than any cathedral — a dwelling for an immortal soul, the tiny perfection of her baby’s body . . .
“The angels have not been blessed with such a grace. They cannot share in God’s creative miracle to bring new saints to heaven. Only a human mother can.